Applications are invited from interested candidates of Assam for admission in to the 1st year of the 3 years Bachelor of Science (B.Sc) programme in Hospitality and Hotel Administration in the Institute of Hotel Management Catering Technology and Applied Nutrition, Guwahati for 2018-19 academic session. Candidate having the 10+2 stage of examination in any stream with English as one subjects are eligible to apply. Age: The age of the candidates from GEN and OBC categories should not be more than 22 years as on 1st July, 2018. Maximum age is relaxable upto 25 years in case of SC/ST candidates . Educational Qualification: 10+2 stage of examination in any stream with English as one subjects are eligible to apply. 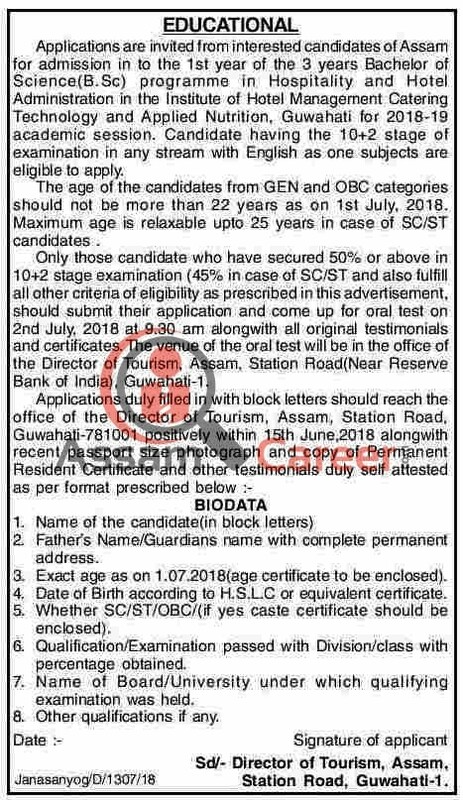 Only those candidate who have secured 50% or above in 10+2 stage examination (45% in case of SC/ST and also fulfill all other criteria of eligibility as prescribed in this advertisement, should submit their application and come up for oral test on 2nd July, 2018 at 9.30 am alongwith all original testimonials and certificates. The venue of the oral test will be in the office of the Director of Tourism, Assam, Station Road(Near Reserve Bank of India), Guwahati-1. 2. Fathers Name/Guardians name with complete permanent address. 3. Exact age as on 1.07.2018 (age certificate to be enclosed). 4. Date of Birth according to H.S.LC or equivalent certificate. 5. Whether SC/ST/OK/(if yes caste certificate should be enclosed). 6. Qualification/Examination passed with Division/class with percentage obtained. 7. Name of Board/University under which qualifying examination was held. 8. Other qualifications if any.